PeaceCast.tv, an inspired online media channel, is now accepting peace-themed video submissions for their September 21st livestream in honor of the International Day of Peace. Got something inspiring to share with the rest of the world? Go for it! Deadline: August 7th. Click here. Or, if you don't want to click there (because you don't like people telling you where to click), click here. 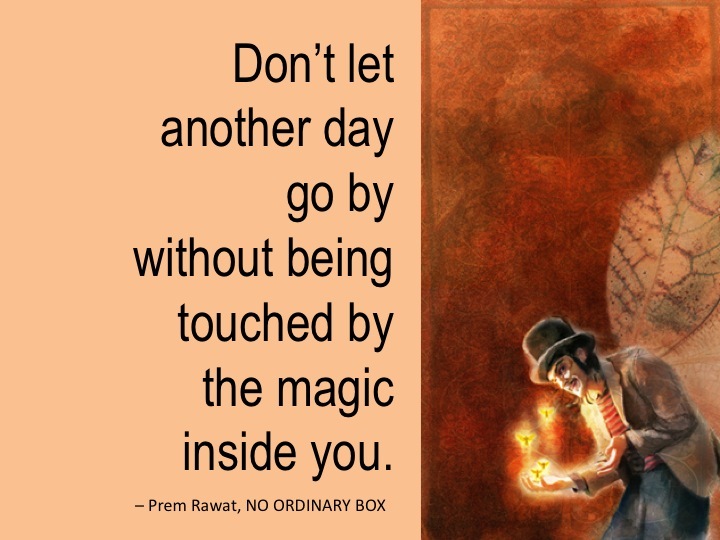 An absolutely fabulous 24-minute interview of Prem Rawat in South Africa, by Lumka Ngxoli. So real. Much fun. Very inspiring. 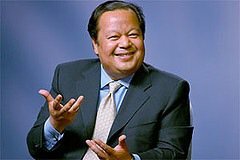 Wonderful 7-minute video featuring the impact that The Prem Rawat Foundation is having around the world. If this moves you in any way and you feel inspired to make a donation to help TPRF continue it's important work, click here. This video completely blows me away. If you ever find yourself moaning about your circumstances and how difficult it sometimes is to get anything done -- especially expressing your innate creativity, watch this. This video is one of many featured on PeaceCast. 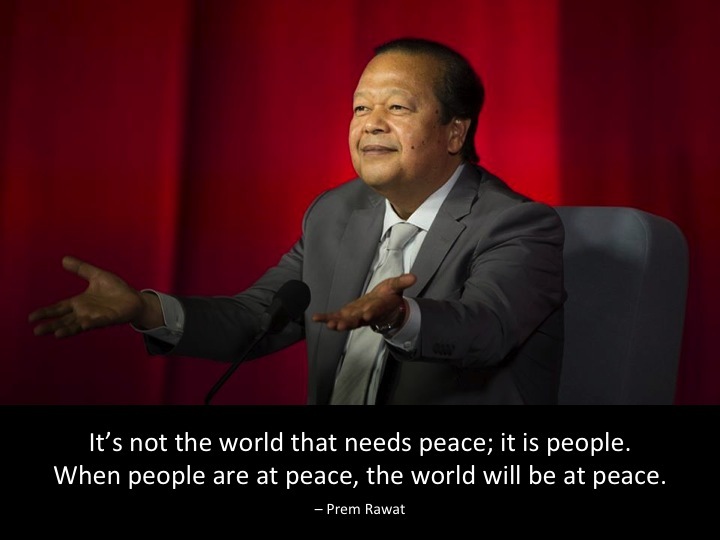 Find out what goes on behind the scenes when Words of Peace Global (WOPG) creates the many videos it produces to support the message of Prem Rawat -- videos seen at events around the world, videos of his events made available online, and Words of Peace TV episodes. This inside look at WOPG's inspired media production efforts is part of a newly launched campaign to raise the funds necessary to continue this important work. Please give what you can. In what ways can you stay more in sync with whatever "flocks" you are a part of? The Gospel of Everyday Life! Life is really simple. All you need to do is click the video below, make sure your speakers are turned up high, and listen. Here's a lucid and inspiring 97-second video, produced by TPRF, in support of the UN-sponsored International Day of Peace on September 21st. Please forward this to your friends and neighbors. With all the drama going on in Syria and other global hot spots, there's never been a better time for this powerful message to go viral. AWAKENING for Words of Peace from Josep M. Civit on Vimeo. Have You The Urge Too? Wonderful Geoff Bridgford music video. Whatever path you walk, whatever your favorite name for God, if it doesn't come down to this, it don't mean squat. Exquisite song. Daya vocals, John Adorney music. Song translated from Hindi by Charananand. From Fire in the Flint. Thanks to Billy "Arctic Ice" Salmansohn for the heads up. A big thank you to Fernando Garcia for using one of my poems, and Stuart Hoffman's music, along with a variety of beautiful images, to create a moving slide show about a topic not often talked about. Wonderful "musical slide show" video invitation to Prem Rawat's upcoming events in Barcelona (May 27) and Madrid (June 10). Music by Manuel Iman. Produced by Stuart Hoffman. Please forward to any one you know who might be interested in attending. A wonderful up song from down under: Geoff Bridgford's Ordinary Man. "For You" available for download here. Big thanks to Filomena Lopes for the heads up! Thanks to Peter Whitaker for the heads up. Fabulous new song by Geoff Bridgford. Here is Jim Carrey, one of the funniest dudes in history, sharing his recent revelation about the illusory nature of thought and the true definition of spirituality as being the relieving of all suffering. The times they are a 'changin. 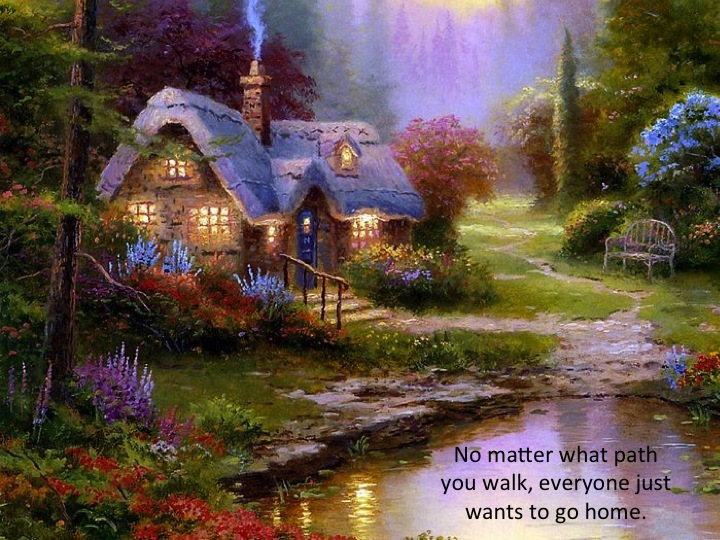 We are all so lucky to be alive -- no matter what path we walk. Everywhere, there are reminders to wake up and feel the love inside. Here ya go. Five inspiring videos for your viewing pleasure -- each one a treasure. Themes? This is beautiful. From David Steindl-Rast, Benedictine monk. Unplug from whatever you're doing and give this your full attention. Bring someone tea today! Help someone in need! Go beyond yourself and express the love you feel in very practical ways. 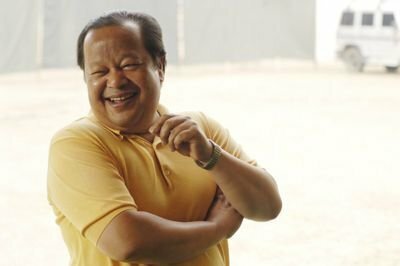 Whether you are a student of Maharaji's or not, I think you'll find this 10-minute video quite interesting. It's all about his lineage and how he is continuing with his Master's vision of letting everyone on planet Earth know that true inner peace exists and is available. Now. Thanks to Jule Kowarsky for forwarding the link. Life is made of moments. Enjoy each one of them! I've always enjoyed Will Smith's movies, but I never really got how tuned in and inspiring he is outside of his roles. Check this out. You may think you know what's going to happen next... but your thoughts are only... well... your thoughts. When you're in the ZONE, something else takes over. If you have any doubt, check out this three minute video about an autistic boy on the basketball court. Go for it! Get on the court! Give it your best shot! Beautiful song... beautiful voice... beautiful life. Watch this extraordinary video about an 11-year old boy who not only remembered a past life of his, but blew everyone away with hard-to-deny proof. Open your mind and your heart to the possibility. This is absolutely stunning, exquisite, buoyant, alive! 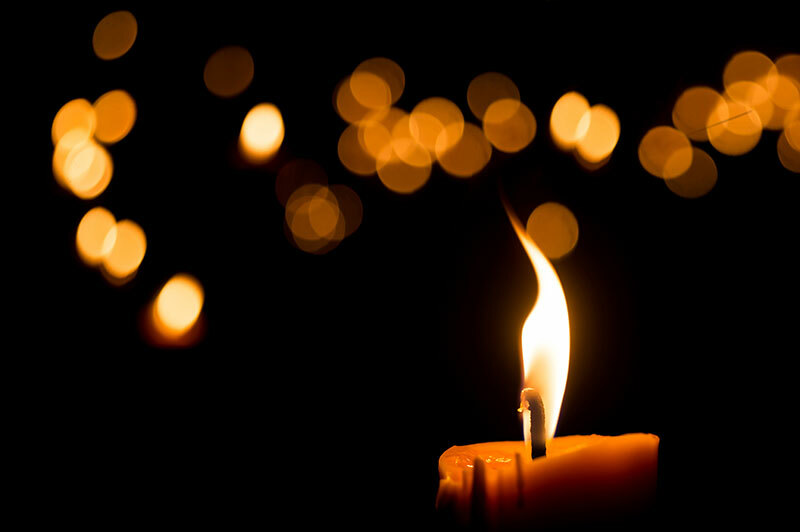 Maybe you've been meditating for 30 years... maybe you've read the Bhagavad Gita... maybe you've experienced the peace that passes all understanding. But have you ever been an 88 year old mayor with a 92% approval rating, gotten hit by a truck, and starred in your own music video? Check this out. Hazel rocks!!! This wonderful video was shot totally by a cell phone in New York City and Sydney, Australia. Makes you do more than stop and think. Makes you stop and FEEL. Eight minutes of Maharaji speaking with the elderly and physically challenged -- in both Hindi and English. Very inspiring. This just in from Italy -- mostly in Italian. So go on down to your local Italian restaurant and ask for a translation. (Hmmm... not a bad way to let people know about Maharaji's message). Fettucine for everyone! Thanks to Lucka Koscak, on Facebook, for forwarding this link. 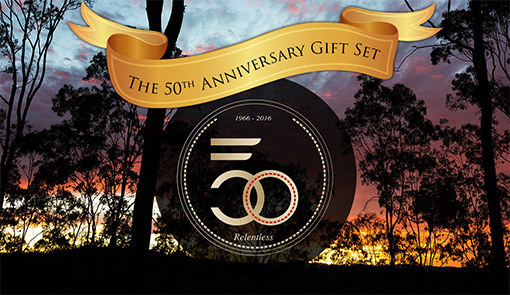 Sweet video/slide show featuring photos from Amaroo and the singing of Alan Thomas. Thanks to Hakan Lars Holmkvist for creating the video and Sonja Clegg for forwarding it, via Facebook. (PS: I am now on Facebook). 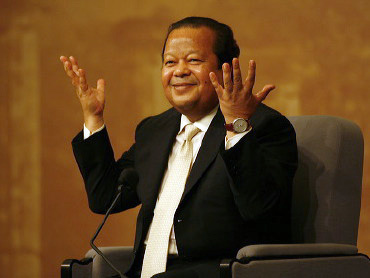 VIDEO: What Is Prem Rawat's Role? Celebrating New Year's Eve? Letting go of the old and ushering in the new? Raising a glass of champagne to love? Then take a look at Heart of the Matter's Best Videos of 2008. Some of them will make you laugh. Some of them will make you cry. But all of them will inspire you to go beyond your seeming limitations and dive more deeply into life. If you're hosting a party, you may want to show a few of these to your guests. MERRY CHRISTMAS! What Is Life? Some people say that laughter is the universal language. Others say love. The producers of the video below say music. Whatever language you speak, one thing is clear: at the core of our being, beyond our differences, we all speak the same language. 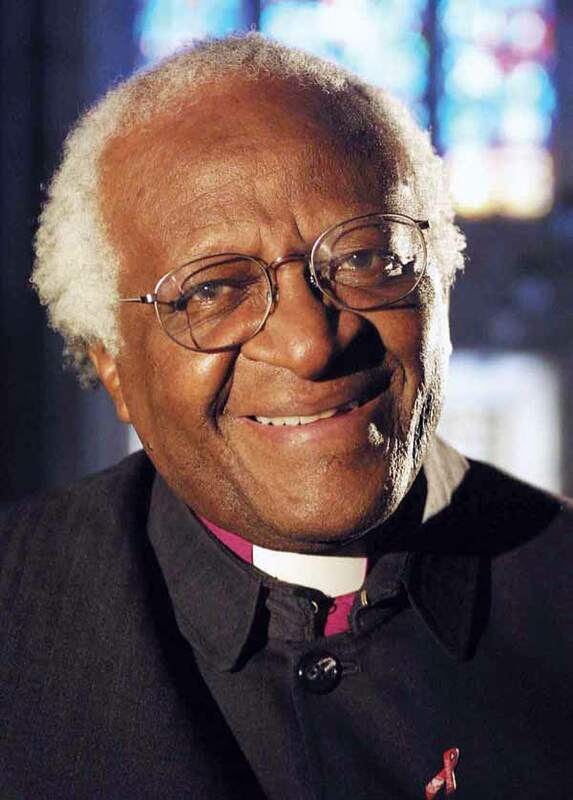 And thanks to Noel Philpot, poet extraordinaire, for forwarding this inspiring video. Speaking of which, what have YOU learned in your life? What wisdom has come your way? And if you want to share it with other readers of this blog, click "Sign In" below and leave a comment or send me an email. I'll sort through the submissions, pick some, and post them here in time for International Wisdom Day (a holiday that doesn't yet exist, but probably should). Beautiful images of love, devotion, and happiness. Beautiful vocals by Tim Hain. Beautiful life! We are all so lucky to be alive. We have so much to be thankful for. Count your blessings! Enjoy each breath! The past is over. The future is a dream. Now is the moment! Four brief interviews with people about the value of Maharaji's gift -- and then a 4 min. 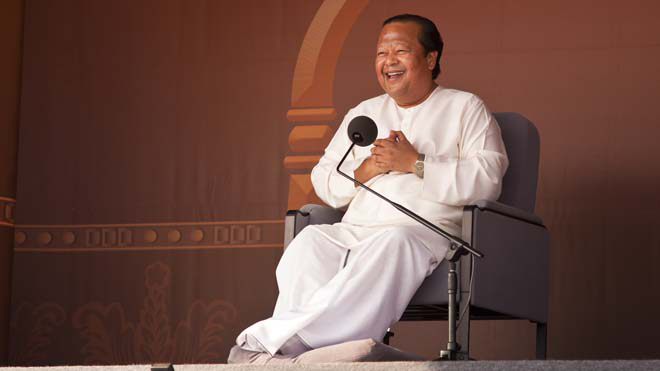 video of Maharaji speaking about thirst, breath, and Knowledge. OK. Here's a wake up call for all of us who think our life or work challenges are impossible. Click below to see what this chap accomplished, then ask yourself whether or not what YOU'RE trying to accomplish (i.e. 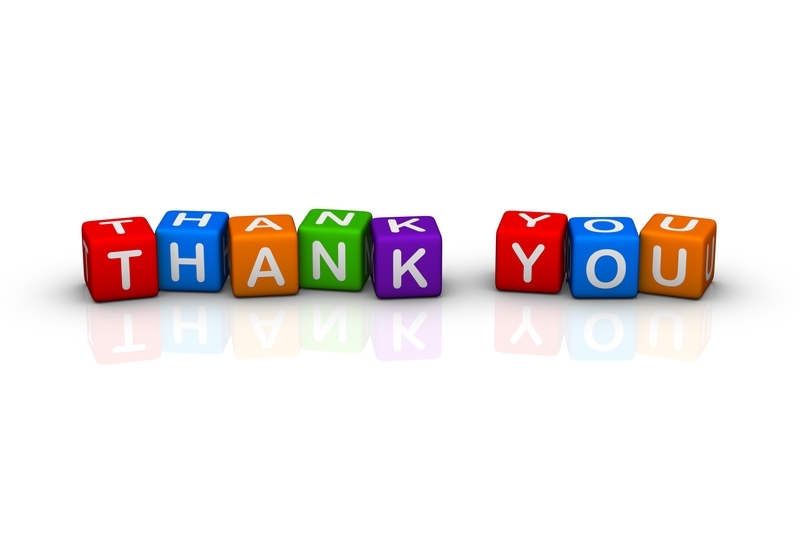 stay conscious, grow your business, make a transition, write a book, practice Knowledge, forgive someone, etc.) is really so difficult to pull off. Thanks to Chris Tardieu for forwarding this video.